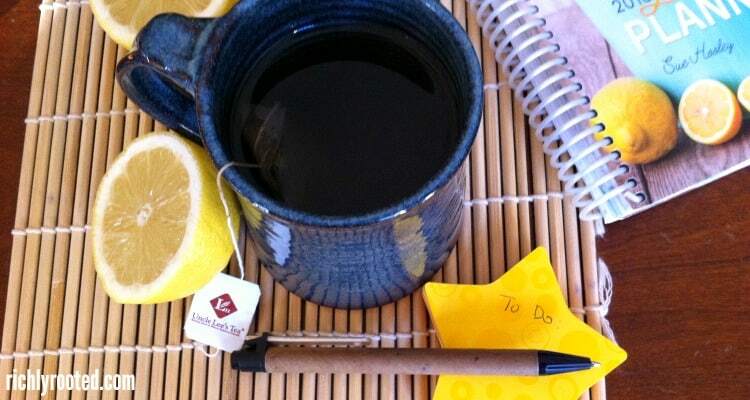 Boost your energy in the afternoon with this natural energy booster tea. Because it is possible to beat the afternoon slump–without resorting to store-bought energy drinks or another cup of coffee! When you get sleepy at 9 pm, you expect it. You’ve put in a full day of working and homemaking and caring for your people. The only thing left to do is relax and then segue into your evening routine and finally your bed. For my own part, it’s important that I stay alert especially in the afternoon, because that’s my window to get work done! Although I work some before breakfast, most of my blogging and virtual assistant tasks happen during Little Dude’s afternoon nap time. And if I’m feeling sleepy and sluggish? The time barely even counts. I have to be fully awake to be fully productive. The other main ingredient in my homemade energy tea is hydrolyzed collagen. Collagen is a protein that’s found throughout our bodies, and is vital for building connective tissue. 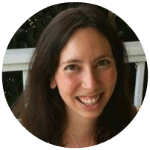 In my superfoods and supplements post, I mentioned wanting to try collagen, so I recently contacted Perfect Supplements and asked them if they would sponsor a post here at Richly Rooted! They graciously agreed, and here we are. (: Perfect Supplements collagen packs a protein punch–10 grams per serving. Adding a scoop to my tea gives me the fuel I need to make it through to supper without mindless snacking. I’m excited to report that when I drink this energy booster tea, my brain fog is gone. 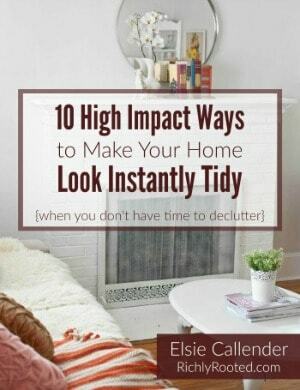 I can buckle down and work without wanting to crawl into a corner of the sofa instead. If you’ve ever found yourself in a similar position–needing to get things done but not having the energy to do them–drink this tea. Green Tea – Green tea is high in catechins (a type of antioxidant), which fight cell damage and prevent the breakdown of collagen. It also contains the amino acid L-theanine, which works in synergy with the tea’s caffeine to give you mental focus–without the jitters (source). Hydrolyzed Collagen – Among many other health benefits, collagen improves gut and joint health, gives you beautiful hair and skin, and supports healthy metabolism and brain function. Lemon Juice – Half a lemon contains about 15% of your daily value of Vitamin C. The Vitamin C works in synergy with the catechins in green tea, making it easier to absorb them (source). In addition, Vitamin C helps your body to absorb and fully use the collagen! Raw Honey – Raw honey contains trace minerals and enzymes, but the main purpose of including it in this tea is to give you a quick energy burst (without wreaking havoc on your blood sugar). Now put all these ingredients together for your energy-boosting tea! 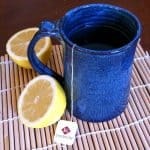 Brew tea for 3-5 minutes in 8 oz of hot water. Let cool slightly, then stir in honey, lemon juice, and collagen until dissolved. This is the brand of green tea we like to get! We get our grass-fed collagen from Perfect Supplements. 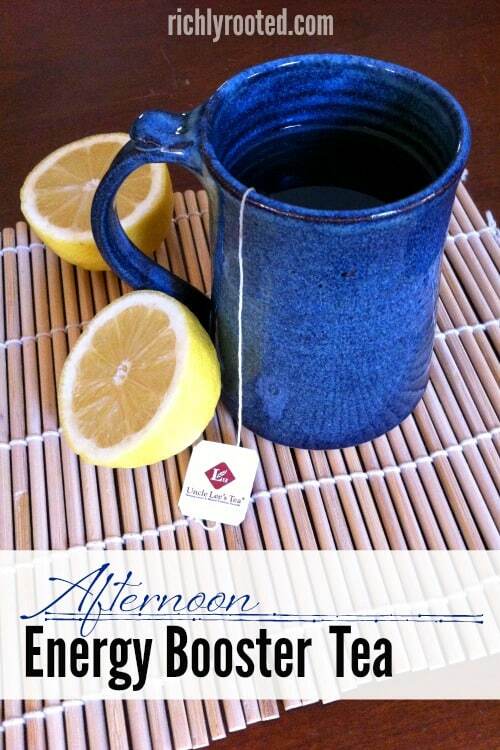 Of course, you don’t just have to drink this tea in the afternoon! It’s also a great energizing beverage to start your day with, especially if you’ll be doing a lot of physical or mental activity and need the protein boost from the collagen. While I love drinking collagen in this tea (the hot water makes it dissolve quickly! ), you can take collagen in a variety of ways. Try adding a scoop when you blend your favourite smoothie. (I like this strawberry cantaloupe pink smoothie, or a yummy peach almond smoothie.) Actually, hydrolyzed collagen can be mixed into any liquid or gel, hot or cold. That means you can add it to yogurt, coffee, salad dressing, dips, your water bottle, soups–anything you like! I love that the collagen from Perfect Supplements is sourced from grass-fed cows and is non GMO. The company is very transparent about their practices and standards, and even offers a money-back guarantee on all their in-house brands (they carry a number of supplements and superfoods in addition to the collagen). 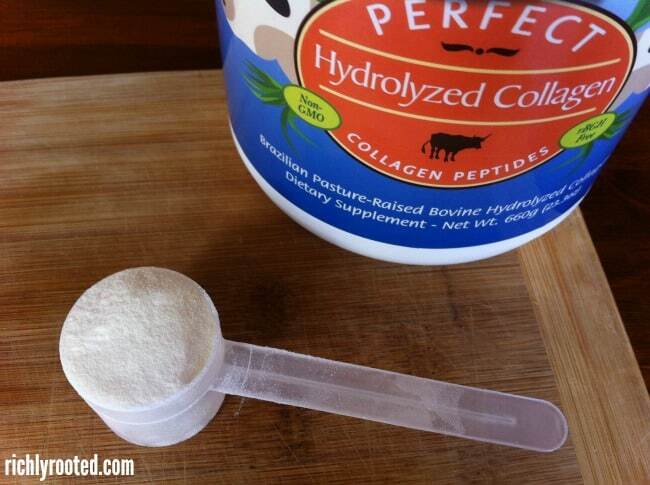 You can order hydrolyzed collagen from Perfect Supplements HERE. I’m not a body builder or anything (that thought makes me smile!) but I do need lots of protein to keep me fueled and energized for all the tasks I need to get done throughout the day. And if I can get some of that fuel in a comforting cup of tea? Next Post » Simple Living in a Travel Trailer…with 8 Kids!